Generally speaking there usually isn’t a need to import MAC addresses into BatchPatch because you can use Actions > Get Information > Get MAC address to retrieve the MAC addresses for hosts that are in the grid. However, there are still times where you might need or want to import MAC addresses. For example, maybe your machines are not on the network at the time that you want to add the MACs to BatchPatch, or it’s possible that using the ‘Get MAC address’ action is retrieving the MAC address for a different network adapter than you want to use for Wake On LAN. 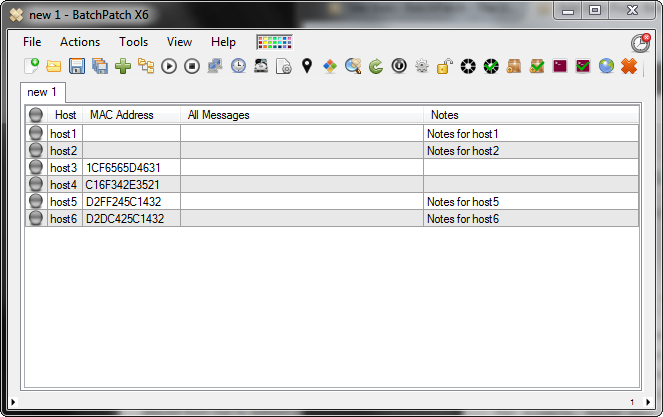 With regard to notes, you may very well want to populate the ‘Notes’ column in BatchPatch with instructions or notes about computers in the grid. There are a couple of different ways to accomplish this task. If you instead paste the above text into a .txt file, you can simply use the File > Open to browse to the .txt file and import it. The results will be identical to the screenshot above. If you already have a grid that’s populated with hosts but you want to add MACs or Notes to that existing grid, the process is almost identical to the steps outlined above. The only difference in this case is that instead of using File > Open or File > Add hosts, you’ll need to first highlight the hosts that you want to import notes or MACs for, and then use Actions > Import notes or MAC addresses. That’s all there is to it. Some admins like to keep one big master .txt file list of all Hosts|Notes, and then when it’s time to start patching they simply setup their BatchPatch instances and import the notes. This is preferable in some instances to manually editing cells. This entry was posted in Blog, General, Tutorials and tagged hosts, import, macs, notes. Bookmark the permalink. Both comments and trackbacks are currently closed.